The following pictures detail a tractor installation in which the ZENA system was installed in such a way as to allow the system owner to easily move it between a service truck and this tractor. 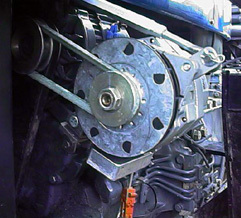 This was easily accomplished by mounting the Welding Power Generator so that its drive belt was separate from the vehicles existing drive belt(s). In this installation, the ZENA system was installed secondary to the tractor's existing alternator and electrical system. The Welding Power Generator is mounted to the tractor's existing alternator using brackets made from strips of 1/4" thick bar and angle stock. Long bolts and spacers made from steel tubing complete the mounting of the Power Generator to the alternator. This is another view of the WPG mounting. In this installation, a bracket and turnbuckle are used to support the top of the WPG and to tension the WPG's short fan belt. Note the double pulley which was installed on the tractor's alternator. Here's another view of the finished installation. As you can see, by loosening the turnbuckle and a single bolt the WPG can easily be removed from the vehicle. Time to install from scratch - approximately 6 hours (including time to design installation, buy materials and fan belt, and parts fabrication). NOTE: We are making improvements in our products continuously Therefore, at any particular time, ZENA's products may vary in details of design and construction from the photos shown here. ZENA™ is a trademark owned by ZENA, Inc. for its welding systems and related products. © Copyright 1998,1999 by ZENA, Incorporated. All rights reserved.